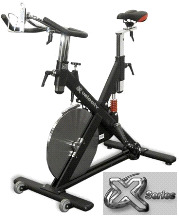 Fitnex X Series Black Velocity Indoor Exercise Bike. For over twenty years, Fitnex has been manufacturing fitness equipment for some of the biggest names in the business. Now, we offer customers a direct product line that offers the best of both worlds – the highest quality equipment, tested and engineered by one of the largest and most experienced fitness related equipment manufacturers in the world, coupled with a pricing plan that represents true value. Our penchant for design shows in every product we make. Fitnex equipment is not only engineered and tested to be the best, it is also easy to use – and stylish. We back every Fitnex product that we sell with our 100% money back guarantee. If you have any questions please call us at (701)223-9936 or Toll Free (800)355-2956. - Length 44” - Width 25.5” - Weight 120 lbs. - 72 Hour Salt Mist Test - Determines the stability of components & equipment for use or exposure in salt-laden atmosphere. - Harsh environments and finished with power coating. - Warranty: 1 Year Parts, Lifetime Frame.